I’ve been on a cornish hen trip lately.. Yes they are a little more expensive than your average bird, but they are tender, delicious, and easy to eat when prepared properly. If you like white meat–they are definitely for you. All of the meat is sweet, mild and tender. 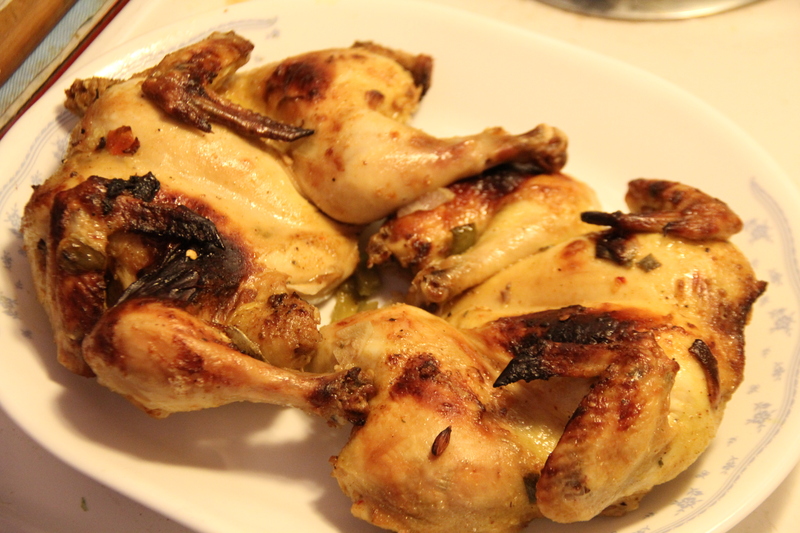 For Kwanzaa, this is a Cornish hen done Yassa style indoors. Yassa is a cooking tradition that is a hybrid of Senegalese (Wolof, Serer, Diola, Malinke) traditions and those brought in by the French and others. It is a citrus based –usually lemon—onion/garlic and hot pepper marinade in which poultry is cooked, or broiled then stewed. My favorite Yassa is broiled or grilled Yassa chicken served over rice…Some yassa recipes contain Dijon mustard and olives, thyme and the like. I like the basic yassa I learned to cook and especially the Yassa by Pierre Thiam in his cookbook, Yolele! I have included the basic yassa I started with–and later we will move on to Pierre’s recipe. He’s fantastic. And I’ve been dying to try the red Camargue rice I brought back from Provence. Provence, the southern regions of France has a region known as Camargue—known for its rice fields and a special heritage breed of cattle named after the region. Although Camargue rice is a fairly recent variety, I can’t get my hands on African red rice, Oryza glaberimma, the type of rice that enslaved Africans probably had a hand in introducing to South Carolina in the 17th century. For the Cornish hens. They need to marinade in a mixture for several hours. For the basic Yassa, I usually combine a crumbled chicken bullion cube or a tablespoon of bullion powder with a teaspoon of kosher salt, a teaspoon of black pepper, a chopped hot green chili, the juice of 4 lemons, a pinch of sugar, a tablespoon of malt vinegar, a chopped red onion, 4 tablespoons of vegetable oil and a chopped clove of garlic. Sometimes I add a sprig of thyme or some fresh ginger. Combine and rub over hens and cover and refrigerate. 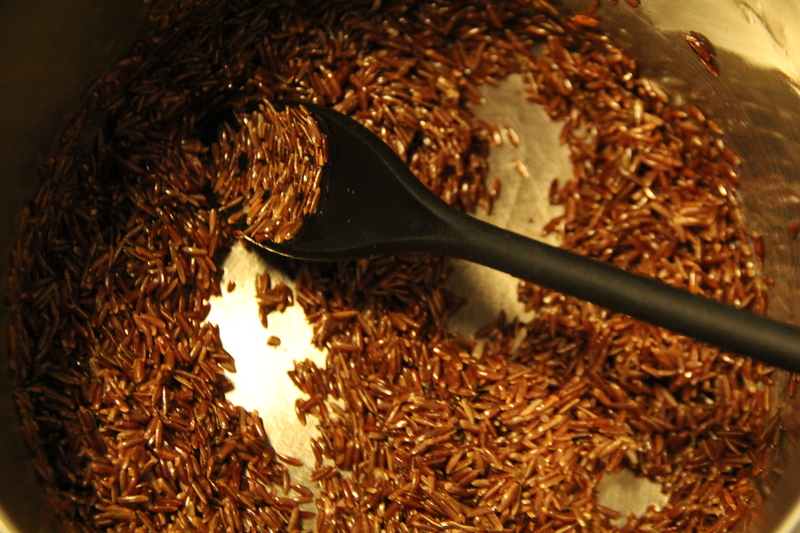 I sauteed a cup of Camargue red rice in a little olive oil with a pinch of salt. After 2-3 minutes on high heat without letting it burn, I added enough water to cover the rice-to about an inch over the rice..I let the rice come to a boil and then brought it down to a low simmer. I covered the rice tightly and let it sit on a low heat for about an hour. Camargue is very sticky so this method produced a rich, whole grain rice that had each grain separate and distinct from the rest. Foil a a baking sheet and place a rack over the foiled pan. Remove the hens from the marinade and split down the middle to butterfly. Place flat on the rack inside down, and brush a little extra oil on the skin. Roast for 45-50 minutes checking to make sure its done. Remove from heat, place on a plate, cover loosely with foil and allow to rest about ten minutes. If you’d like brush the hens with lemon and lime juice for extra flavor. Pour strained juices from pan into a saucepan and allow to come to boil and cool slightly. 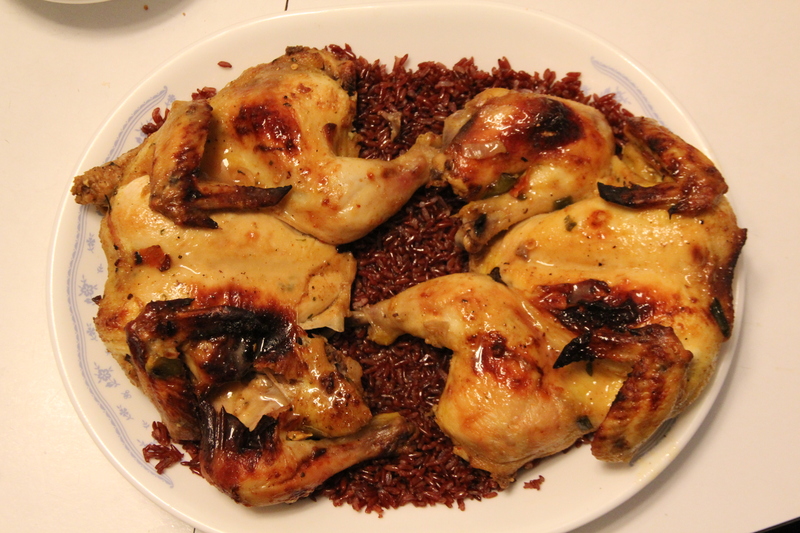 Spoon red rice onto a plate and place the hens on top, sauce the hens with the reduced yassa juices and decorate to taste and serve. This recipe sounds delicious but what about the wonderful caramelized onions that “generally” accompany Yassa? I mean Yassa has so many forms. Its a dish born out of the colonial presence played against indigenous foodways. Some people do dijon mustard, others olives, some do caramelized onions and others just stew the onions, some just saute, while others grill then saute, and some just grill with a sauteed sauce..this is just one form of a classically important Senegalese “national dish.” Enjoy!